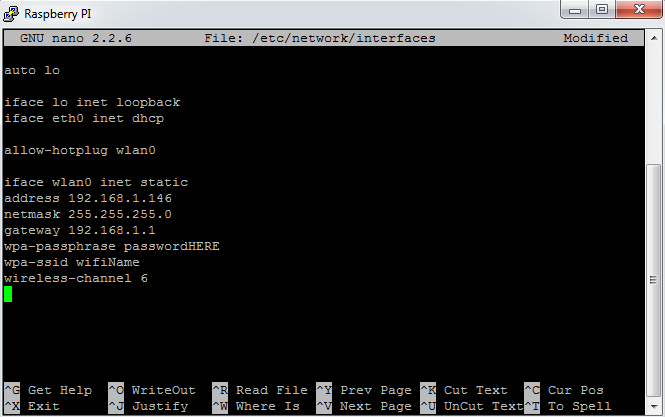 By default, Raspberry Pi uses DHCP to get an IP assigned. That is okay, but the assigned IP can change over time or after powering off. This will cause problems when you need to remotely access your device. It is even harder to forward ports on your router if the IP keeps on changing. Therefore it is more than wise to assign a static IP to your device. The IP will remain the same and you will be able to use ssh and VNC with the same settings over and over again. auto wlan0 allow-hotplug wlan0 iface wlan0 inet static address 192.168.1.146 netmask 255.255.255.0 gateway 192.168.1.1 wpa-passphrase pass wpa-ssid ssid wireless-channel 6 #wpa-roam /etc/wpa_supplicant/wpa_supplicant.conf iface default inet dhcp And reboot. Next to wpa-passphrase you need to type in the password for your Wifi, next to wpa-ssid type in the name of your Wifi and after wireless-channel you have to put in the channel that your Wifi is broadcasting on. If you are having difficulties with this, connect to your router and try to get the appropriate information.